1. Hate is a very strong word. 2. Inanimate objects can be neither smart, nor stupid. Except for you, stupid TV remote. 3. Saying “time to get a new watch,” when someone asks “what time is it?” never gets old real fast. 4. Adults write in cursive, not print. 5. 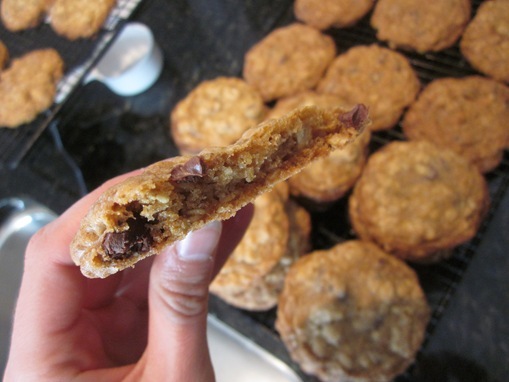 Chocolate chip oatmeal cookies never go out of style. So what better way to kick off the start to my 12 Days of Cookies challenge, than to make my all-time favorite cookie? Trick question, there is no better way. Do you see that recipe card? All those stains, crinkles and leftover batter are the mark of a truly cherished cookie recipe. Cookies you keep making over and over. Cookies you can remember your mom making when you were younger and had no qualms about eating five in a row. One made with shortening and butter and sugar and chocolate and lots and lots of love. Things made with love have zero calories and zero grams of sugar, didn’t you know? So eat four and share that fifth one with someone you love. Combine soft shortenings, sugars, eggs and vanilla. Add flour, salt, soda and water. Then add chocolate chips and oatmeal. Place on cookie sheet by the heaping teaspoon. Bake 10 minutes or until golden brown. **If you’re feeling frisky, add some chopped walnuts to your dough. And it’s highly recommended that you start feeling frisky now. 1. If you leave them in a room with two 20-something year old guys, they will devour them in a few hours, so get your fill before you leave them unsupervised. 2. Leaving the dough in the fridge for a few minutes results in fluffier cookies. 3. Whether they’re fluffy or not, they’re deliciously addicting. 4. Even moms burn things. 5. 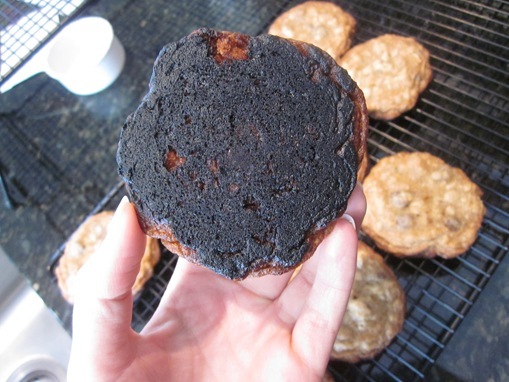 Burnt or not, they still taste better when mom makes them. haha! the burned bottom makes me chuckle. for some reason the same thing always happens to me. i think i need new pans too! Who doesn’t like chocolate chips?!?! Mmm, cookies ARE always better when mom-made. I love classic go-to cookie recipes, I have one page in a cookbook that’s always a struggle to open due to spilled sugary goodness, but it’s worth working open for the coconut-oatmeal cookie recipe inside. Your blog is SNOWING!!! How did you do that?? You are so awesome. Also cookies, yum. 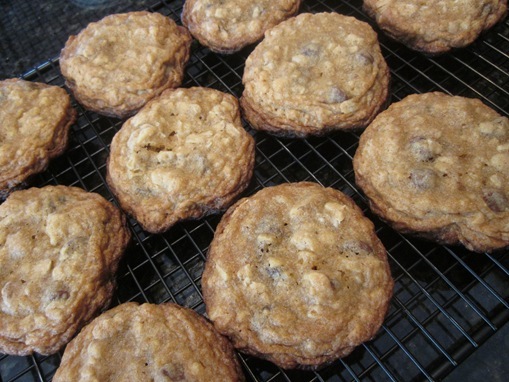 Will be trying the recipe later today as chocolate chip cookies are the Fav around here. Love to try new versions. Love the snow falling on the page.